WrestleMania 31 is a very special one for your humble commentator, this is the very first WrestleMania I got to watch live, thanks to the Network. My parents aren’t into wrestling and we couldn’t afford the PPVs anyway, so getting to watch a WrestleMania live made it very special to me. WrestleMania 31 comes to us from the San Francisco area and it marks the first time Roman Reigns main evented WrestleMania. 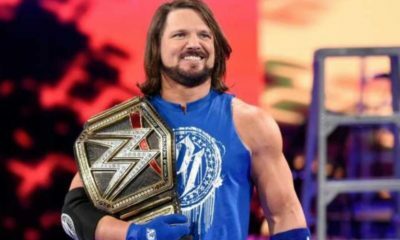 It would also feature a dream match of the Monday Night Wars, the return of the Undertaker after his shocking defeat at the hands of Brock Lesnar at WrestleMania 30, and Daniel Bryan’s return from a career threatening neck injury. 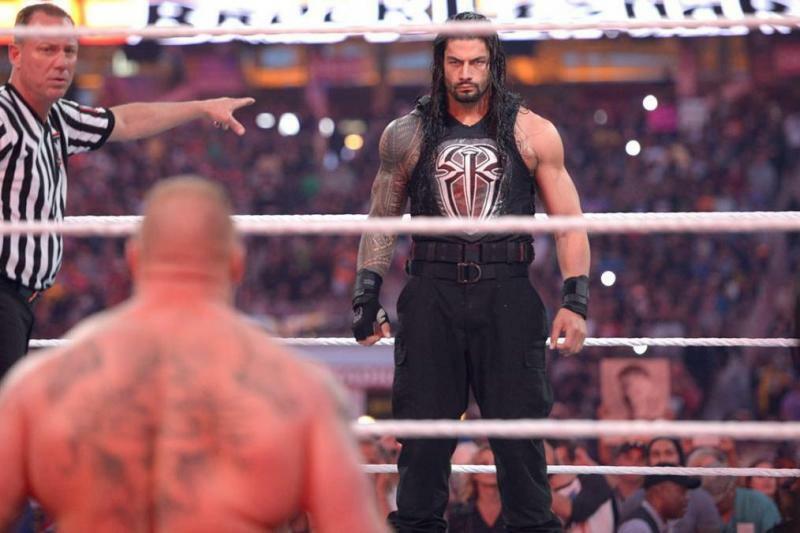 So how does WrestleMania 31 hold up to all this potential? Let’s find out! We start with LL Cool J talking about what ‘Mania’ means and a montage of Mania moment. Not much to talk about, it was really quick. Usos are coming out first to a really good pop, especially being announced from San Francisco. Los Matadores get no reaction. New Day get no reaction, which is weird to hear, considering how over they became. Kidd and Cesaro get the best pop. I’m not sure why every team in this has a manager, but we start off with Cesaro and Kofi. Cesaro gets tagged out and attacks Jey Uso (I think). This is a really good match, but all the teams made it a little hard to keep track of what was going on. All the teams looked great, and Jimmy Uso trying to win it all by himself was really over with the crowd. All the managers at ringside just seemed to add to the chaos of this match and not in a good way. It was almost a 12 person mixed tag. Winner: Cesaro retains the titles for his team by pinning Big E.
Highlights: Jimmy Uso trying to win the titles by himself. Los Matadores hitting a Powerbomb/Backstabber combo. El Torito taking out Kofi and Natalya taking out El Torito. Comments: This was a good match, but there was too much going on that was unnecessary. No one is getting an individual entrance for this, which is sad. I forgot that the tag teams from the previous match are also in this thing. Axel is running his mouth over the Royal Rumble (Dude, you were never IN the Royal Rumble, shut up) and is thrown out by the majority of the participants. The final three comes down to Big Show, Miz, and Mizdow. Miz tells Mizdow that they’ll take out Show together, but Mizdow refuses. Miz gets up in Mizdow’s face and basically TELLS him that they’re going to take on Big Show together. When Mizdow STILL refuses, Miz throws a fit and starts poking him in the chest, HARD. Mizdow’s finally had enough and eliminates Miz, to Miz’s fury. Meanwhile, Show just stands in the corner and waits for them to work their issues out. Now that Miz is gone, Show and Mizdow can get down to business. Show doesn’t think Mizdow has a prayer of getting him over, but Mizdow is going to try. Show throws Mizdow over the top rope, but Mizdow hangs on and takes it to Show. Mizdow gets Show into the ropes, but Show is just too big and strong. Mizdow gets Show over the top rope to the apron, but Show catches him in a chokeslam. Mizdown tries to pull a Benoit from 2004, but Benoit was a lot stronger than Mizdow and Show eliminates him. 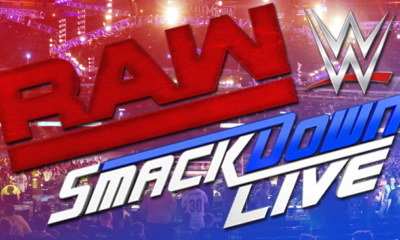 Winner: Big Show by eliminating Damian Mizdow. Show finally won a battle royal. Highlights: Axel being eliminated, Gabriel and Fandango eliminating each other. Mizdow FINALLY turning on Miz. Itami eliminating Bo Dallas. Comments: That was a really good match. Good for Big Show. We start with Aloe Blacc singing ‘America, the Beautiful’. He sounds fantastic. We start with LL Cool J talking about how people have been brought together since radio and TV and how WrestleMania is the same way. We get a montage of WrestleMania moments. Bryan is out first to a huge pop. Barrett is out next a chorus of boos. Ziggler gets a great pop. Stardust gets little reaction, though his outfit looks…cool. Harper gets little reaction. R-Truth gets an okay reaction. Ambrose gets a huge reaction. This was a really great match. Everyone got their spots in and it really could’ve been anyone’s game. I darn near had a heart attack when Dean was put through the ladder. Winner: Daniel Bryan retrieves the IC belt. The crowd LOSES it. Highlights: Ambrose’s elbow drop off the ladder. The ‘Cody’ chants. Stardust’s special ladder. The fate of said special ladder. Comments: That was a great opening to WrestleMania. This would be Bryan’s last WrestleMania appearance for a few years due to his seeming retirement due to concussion-related brain injuries. Seth and company get a great pop. Seth seems pretty chipper. I remember how much I hated him back then. Orton gets a great pop. He’s achieved that status where he’s cheered whether he’s a face or heel. This match gets off to a slow start, but these two are equally matched. Something I’m hearing that is irking me greatly is that somehow Rollins is a relative newbie in the business, when he’s actually been working in professional wrestling about as long as Orton has, and most of the guys in the first few generations of NXT. Randy is one of the few people who can take the turnbuckle bomb correctly and with Rollins out, he turns his attention to J&J, but that costs him because Seth hits the suicide dive. The commentators make a good point, Randy’s getting too caught up in the emotion, or he’s too arrogant to take Rollins seriously. This was a really great match in terms of story and ring work. Orton and Rollins have very similar styles and are equal in terms of experience, so it made the match very nice to watch. Highlights: Orton countering the Curbstomp into an RKO. We have a promo for the WWE Double Attack Figures. We see Ronda Rousey in the audience and she’s having a blast. 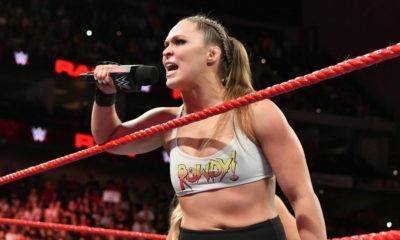 Lawler jokes that Ronda looks like she wants to get in the ring herself. We get a video package for Triple H vs Sting. There’s a drum group with makeup like Sting’s performing his entrance. Sting gets a really great pop. He looks like he really wasn’t expecting that reaction. Something is smoking in the background, I hope that’s supposed to happen. Triple H’s entrance starts with a video of the Bay Area and then it turns apocalyptic. Oh, that’s right, they put Arnold in the Hall of Fame and he let them borrow the Terminator for Triple H’s entrance. Even the robots know Trips is going to be booed. ave to admit, Triple H’s Terminator/Skull King gear is pretty cool, and he gets a great pop on top of it. JBL tries to say Sting is intimidated, Sting doesn’t look impressed, in my opinion. The man’s faced off with a lot of legends, he’s not worried about Triple H.
We start with a face off, both men trying to play mind games. This match really isn’t going anywhere. Even if I didn’t know what was going to happen, it looks like they’re waiting for something to happen. This commentary about Sting is getting on my nerves in a BIG way. I realize that Cole, Lawler, and JBL are more familiar with Triple H, but their shock over Sting being good and being dominate is really annoying me. Also, JBL saying that Sting tried to put WWE out of business is certainly not true and was uncalled for. The whole DX/NWO thing would’ve been cool right after WCW went under, but almost fifteen years later, it’s feeling a little flat. All in all, this was a really good match, but I wish they hadn’t waited until AFTER the run ins to pick up the pace. Highlights: NWO/DX face off, even though the three original members of the NWO were top WWE guys first. Comments: I liked this match, but I would’ve preferred Sting/Undertaker instead. The run ins of the NWO and DX made things a mess. Also, this would be Sting’s only WrestleMania appearance. He would retire due to injuries in 2016. Maria Menounos has an interview with Daniel Bryan and we get this really irritating (at least to me) segment where he gets congratulated by former IC champions. Halftime show time: Travis Barker, Skylar Gray and Kid Ing (I think). This is okay, but I’m still against taking time out just for a musical act. Paige and AJ both get good pops. Surprisingly, so do the Bellas, despite being the heels. Paige draws first blood, but Nikki fights back, takes out AJ and hits Paige with an Alabama Slam. The Bellas take control pretty quickly and without AJ, this is pretty much a handicap match. I really liked this match because the women of Total Divas, the Bellas especially, get a bad rap for only being on the roster for their looks. Nikki, Brie, and Paige really showed that they were every bit as athletic and talented as the guys or the women in NXT. Winner: AJ gets the submission. The Bellas aren’t happy, but Nikki’s still the champion. Highlights: The Bellas showing why they aren’t people to dismiss or take lightly, despite what the naysayers want to believe. Comments: The thing that annoys me most about this match is the fact that AJ did basically nothing but got the victory for her team. However, this would also be AJ’s final WrestleMania. She would retire shortly after this match. Rusev’s entrance starts ‘Russian’ soldiers, Russian flags, tanks, cannon, the Russian National Anthem. Lana comes down to the ring bearing the US Title, escorted by soldiers. The cannon and tanks fire blanks and Rusev comes out ON a tank. The crowd is not happy about this, but it looks cool. For whatever reason, Rusev’s ACTUAL theme doesn’t start until he gets to the ring. We also get the start of the falling out between Rusev and Lana that would be a big storyline (for better or worse) during the summer. Cena’s response is a tribute to American greatness and ingenuity. Even with all that, Cena’s pop is mixed. And he doesn’t come out in a tank. Rusev is a jerk to Eden Styles and insists on being introduced first, much to Eden’s annoyance. Cena draws first blood and goes for the quick pin, not sure why, Rusev responds and this match gets physical very quickly. This was a rough and physical match, but the story was really great and Rusev and Cena worked really well together. Rusev plays the arrogant heel very well, but he’s not a coward, thankfully. This match was very back and forth and Rusev really looked great. People griped at the time about Cena beating Rusev, but the way he beat him actually protected Rusev. Rusev was beaten because of a distraction after accidentally hitting Lana, so the win was a luck break for Cena, not a burial. Winner: John Cena by pinfall, we have a NEW US Champion. Rusev is furious and berates an injured Lana and storms off, leaving Lana behind. Highlights: Rusev’s entrance. That was seriously awesome. Comments: I really liked that match. Triple H and Stephanie announce that WWE has set a new attendance record for Levi Stadium: 76,976!!! Wyatt comes out first and as he makes his way to the ring, seems to bring zombie scarecrows to life, which is really creepy. It’s not dark enough for the fireflies to come out and the lantern looks a bit ridiculous, but it’s an eerie entrance. It’s not dark enough for the lights to go out for Taker, but that’s okay, the entrance is still creepy. The Deadman Cometh to a great pop. Wyatt looks like he’s about to pee his pants. As JBL puts it ‘Bray Wyatt wants to dance with the devil? Welcome to hell!’. Taker looks much better than he did at WrestleMania 30 and Wyatt looks like it’s just occurred to him what he’s gotten himself into: He just called out the devil, and the devil isn’t happy. Wyatt tries some mind games, but it’s like an amateur trying to outdo the master. Wyatt finally charges at Taker and gets a boot to the face for his trouble. Oh, this is much better than last year. Taker looks in much better shape and he’s taking this fool to the woodshed. Wyatt gets in his first offensive move, but Taker gets up. Wyatt clotheslines Taker to the outside, but Taker lands on his feet and pulls Wyatt outside. This match was 100% better than the match with Lesnar. Taker looked terrible in the Lesnar match. He looked like a sick old man and the concussion he received during the match just made it worse. In this match, he looks much healthier and seems to be firing on all the cylinders. Highlights: Taker sitting up during Wyatt’s spider move and Wyatt folding like a cheap chair. Wyatt’s face when Taker gets him in a chokeslam. Comments: There was some controversy over Taker coming back. A lot of people didn’t see the point because the Streak was over, and Taker had only been coming back for WrestleMania, but I love that he came back. 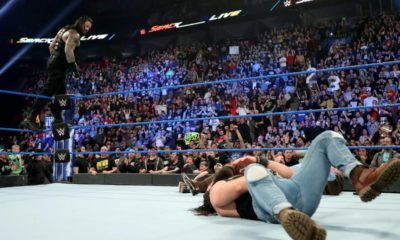 It was as if he wanted to prove that the Streak was not the only thing about his career that mattered and to dispel the image of the old man who lost to Brock Lesnar. Roman comes out to a mixed reaction. He got a lot of flack for all the security, but given the reaction and the amount of people, it’s totally understandable. Lesnar gets a good pop, Heyman insists on introducing Lesnar himself. 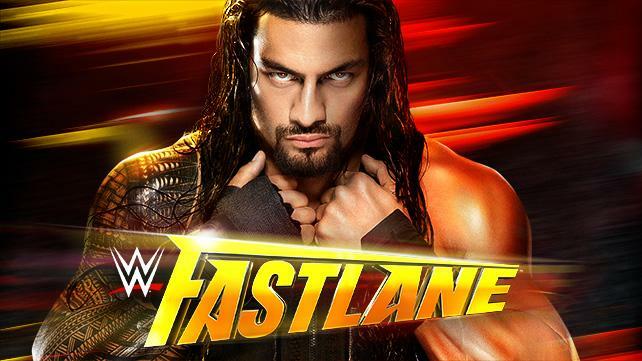 Roman makes the first move but Lesnar dominates this match, but Roman keeps getting up. This isn’t a technical match, this is a fight, and it was a stiff one. Lesnar dominated most of the match, but Roman gave as good as he got, especially when it came to slugfests when he found an opening. Neither man pulled punches and Lesnar’s face was starting to look lumpy from all the bruises. I was a little disappointed that Roman didn’t get more offense in, but I think it was to play up Lesnar being an arrogant heel. 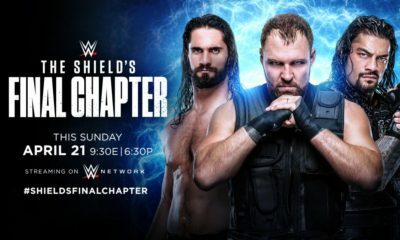 Rollins got a huge pop when his music hit and everyone knew what this meant: He was going to cash in and not only be the first to cash in at WrestleMania, but the first to cash-in mid-match and we have a Triple Threat match. Seth makes a mistake though, but targeting Lesnar instead of Roman. Lesnar was bleeding, but he wasn’t so far gone that someone Seth’s size could take him out. Lesnar gets Seth up in a F-5, but Roman’s spear saves Seth, who thanks him by giving HIM the curb stomp for three and we have a new champion! Winner: Seth Rollins by pinfall on Roman Reigns. Seth stays just long enough to get his hand raised then takes off like a bat out of hell. Highlights: Seth’s cash in. Roman making Lesnar bleed his own blood. Seth celebrating with the title. Comments: The ending of this match enraged me in 2015, but looking back, I can see that Roman wasn’t ready to be the top guy just yet. He still needed to grow and develop his ring and promo skills, whereas Rollins was ready for that spot. So, how did WrestleMania 31 do? Overall, it did really well. I’ll admit that I noticed issues that I didn’t notice when I first watched it because I was so excited about getting to see my first WrestleMania LIVE, and enjoyed some matches more than I had the first time around. This was a really good show overall and it’s one I recommend watching for its own merits. Snoozers: Triple H vs Sting. It started too slow and they were clearly waiting for the run ins. Stinkers: Tag Team match. The match was good, but every team having a manager and the managers getting involved made it too chaotic. Match of the Night: Cena vs Rusev. That was really an awesome match. Warrior Award: Connor ‘The Crusher’ Michalek. Final Thoughts: I enjoyed this show, and had a lot of fun watching it when my Network would cooperate.